Monsignor John Patrick Carroll Abbing was born in Oldham, a small village near Manchester, on 11 August 1912, into a family of Irish descent. He spent his childhood and teenage years between England and Ireland until, at age 18, he decided to move to Rome to start his priestly education. Ordained in 1936, the monsignor continued his education in Rome, until 1938, when he was called to serve in the new office of the Holy Seat “Actio Catholica” as secretary of Cardinal Giuseppe Pizzardo. As World War II broke out, Monsignor JP Carroll Abbing settled in the War Hospital “Principe di Piemonte” of the Sovereign Military Order of Malta, where he served from 1940 to 1944 as voluntary Chaplain, devoting all his time to assisting the wounded. After 8 September1943, at the beginning of the German occupation of Rome, encouraged by Pope Pius XII he tried to help the persecuted and the wanted of all sorts. Together with several Rome youths, he rescued civilians in the war zones, where the German authorities did not impede his good deeds. Because of his bravery, at the end of the conflict, the Italian Government bestowed on him the Silver medal for the military value “on the field”. After the war, Monsignor Carroll Abbing adequated his rescue organization to the new needs: he organized meals for the poor and the boys, healthcare centres, clinics for the treatment of the ill, dispensaries for the free distribution of medicines, provisional shelters for youths without a family. Then he founded the Opera Nazionale per le Città dei Ragazzi (National Work for the Cities of Youths), aiming at providing the guys without a significant family background with assistance and social and professional education. 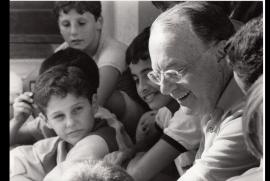 In 1969, he also created the Istituto Internazionale per lo Studio dei Problemi della Gioventù Contemporanea (International Institute for the Study of the Problems of Contemporary Youth), aiming at promoting and development, in Italy and abroad, study, research, training and service initiatives, so to deal with the juvenile problems and solve them whenever possible. Later on, he received from the Italian Government the Grand Cross to the Merit of the Italian Republic and he was elected Grand Cross Knight of the Sovereign Military Order of Malta. In 1985 the Foreign Press Association in New York chose him as the winner of the World Humanitarian Awards. In 1988, instead, he was nominated for the Peace Nobel Prize. Well twice, in the Jubilee Year 1974 and in the Holy Year 1983, Monsignor Carroll Abbing was the President of the Commission for the Youths, within the Central Committee for the Holy Year. He died on 9 July 2001, surrounded with his youths and the love of those who have believed in his project.